So said one of the speakers this morning in London, as thousands of people, from young and old, took part in the first major #InternationalRebellion week of action – a carnival of resistance on climate change. The scenes from London of non violent protest are awe-inspiring as thousands demand urgent action to our climate emergency. As I write, in London’s iconic Parliament Square, the so-called people’s assemblies have been discussing what action to take. In Parliament Square, the people’s assemblies have finished for now. We have listened to the voice of the crowd and decided to take action. Action includes blocking roads, playing music, planting trees, signing, marching, drumming, sitting, walking, listening and empowering others to take action. 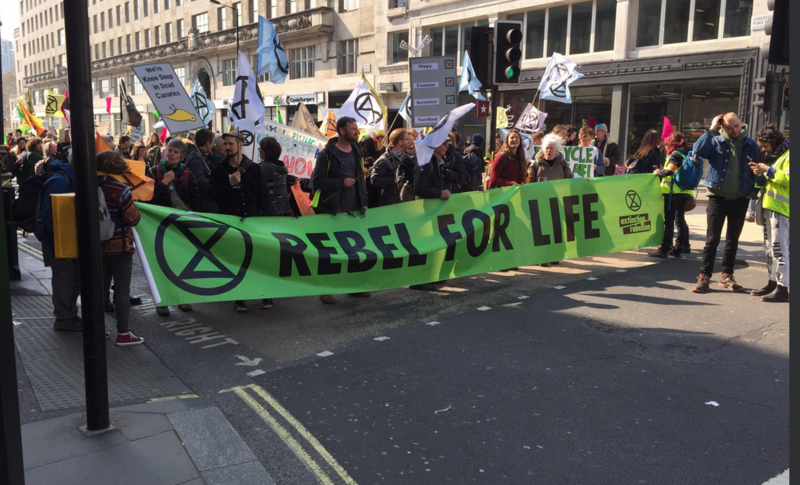 Thousands carried flags, many in the distinctive logo of Extinction Rebellion. Many were dressed up in creative costumes – from adults dressed as dancers or clowns, to kids as tigers or owls. Some preyed. Others played chess. People sewed or made banners. Everyone had fun. Other iconic London landmarks were blocked too. Marble Arch, Piccadilly Circus and Hyde Park Corner have all been taken over by a sea of colourful protest. So too has Oxford Circus, where there was what one person called “peaceful creative conscious disruption”. At one stage Oxford Circus was blocked off by a large pink yacht positioned in the middle of the Circus. It was emblazoned with the words: “Tell the truth”. Meanwhile, Waterloo Bridge is currently traffic free. Hundreds of trees line the bridge. The bridge has been turned into a garden. Protesters were calling it the women’s bridge. There was also a skate park in the middle of the road too for the kids. “If someone a year ago had said I’d be off work to take part in this rebellion, I’d have laughed. The gravity of the situation only recently hit me and I know there’s no going back. Whereas many people protested peacefully, others believe that the crisis demands more controversial action. Earlier today, the side of the Shell Centre building in London was sprayed with words like “Shell Kills”, “Lies” and “Shell Knew” in reference to the fact that the oil giant knew about climate change for years. A few activists super-glued themselves to the building. Regular readers of this blog will need no explanation as to why “Shell Kills” was written on the side of the building. Just ask the people of the Niger Delta. One of those arrested at Shell was Katerina Hasapopoulos from Stroud, who said: Shell is already responsible for destroying lives in places like Nigeria. I’m taking action because our government is inept, Shell cares only for profit and I have three beautiful young girls who I want to see grow up to have a future. That looks unlikely as long as companies like Shell can act with impunity. Simon Bramwell 47 an ex-builder and co-founder of Extinction Rebellion was glued to the door of Shell too. He said: How can we not act? It’s clear as day that we need to protect our communities, our rapidly vanishing nature and its just as clear that companies like Shell are responsible. They must be held accountable. We are trying to prevent crimes against humanity through our actions. But it is not just London. The International rebellion has spread, with protests, marches, speeches, sit-ins taking place in some 80 cities in 39 countries. There have been other actions in Mexico, Spain and Australia. Miriam Robinson from Extinction Rebellion Melbourne said: It’s time to declare a climate and ecological emergency. We are in the midst of the sixth mass extinction, but the government has been pouring billions of dollars into fossil fuel infrastructure – more gas hubs, ports, coal mines and roads, while sadly neglecting and degrading the natural world. Extinction Rebellion’s goals are threefold, demanding, as the pink yacht demands that “Governments must tell the truth by declaring a climate and ecological emergency, working with other institutions to communicate the urgency for change”; secondly that “Governments must act now to halt biodiversity loss and reduce greenhouse gas emissions to net zero by 2025,” and thirdly that “Governments must create and be led by the decisions of a Citizens’ Assembly on climate and ecological justice”. Everywhere, people are rising up. As British Green MP, Caoline Lucas said: “With disruptive, nonviolent action, they’re forcing climate emergency onto political agenda – now politicians must respond”. That so many people are involved and excited about activism is great – but we must be wary of glorifying arrests and incarceration as the only valid way of engaging with a movement .. It should be about as many people as possible being brought on board. About making noise from all parts of society that’s so deafening, there is no option for those in power but to listen to our demands. That is the challenge for all of us. We need politicians to act. But we need everyone to act. Back in Parliament Square the contributing editor of New Internationalist magazine, Jamie Kelsey Fry, said: This is not a political movement, this is a movement of humanity. We are all backgrounds, all ages, all races, bound together in one wish, one dream, which is that we will have a good, decent, loving future, for generations to come.